For more than a thousand years, West Africa has been one of the world's great textile-producing regions. The yarn available locally for spinning was cotton, which grew in at least two colors, white and pale brown. In some places a wild silk was also spun, while raffia and bast fibers were available in addition, as were imported textiles and fibers from trans-Saharan and coastal trade networks, the latter from the late fifteenth century onward. Only in the inland Niger delta region of Mali were the wool fibers of local sheep of sufficient length to permit spinning, whereas north of the Sahara wool was the major source of spun yarn. Fragments of bast-fiber textile were recovered from the ninth-century site of Igbo-Ukwu in Nigeria, and cotton and woolen cloth from eleventh-century deposits in Mali, suggest traditions already well established. (Earlier archaeological textiles from Egypt and the Mahgreb are beyond the scope of this essay.) Elsewhere in the sub-Saharan region, in the forests of central Africa, raffia was the only available fiber, and in the savannas of east and southern Africa cotton was spun, at least as far south as Great Zimbabwe. Throughout West Africa the most widely used dye was a locally produced indigo, also exported for use north of the Sahara, though in both regions other colors were available from vegetable and mineral sources. These dyestuffs might be used on the yarns prior to weaving, sometimes tie-dyed to form simple ikat-like patterns, and they were used in the coloring and patterning of woven cloth. In some areas woven textiles and tailored garments were embroidered, especially in the region from Lake Chad westward to the inland Niger delta of Mali. There was also some occurrence of patchwork, appliqué, and quilting; and one tradition of handprinted cloth. Hand-printed cloth was also found in Zanzibar, brought from India. In the raffia-weaving region of central Africa, cut-pile embroidery was well developed together with appliqué and patchwork. In eastern and southern Africa, local textile traditions seem to have depended on the weaving process for patterning. From the late nineteenth century onward, local textile industries in sub-Saharan Africa have had to compete with factory-printed cotton cloth, sometimes successfully, though in eastern and southern Africa the local production of woven cloth was supplanted in the early twentieth century. The felting of vegetable fibers to produce bark cloth (strictly speaking not a textile) has survived in Ghana and Uganda, though it was at one time more widespread. The mechanical basis for the interlacing of warps and wefts throughout pre-industrial handloom production in Africa takes one of two forms. The most widespread system consists in leashing one set of warps to a single heddle-rod, which is manipulated with the aid of a shed stick. This is the basis of the upright fixed heddle loom used by Berber women in north Africa for weaving the fabrics used in their clothing, and of the loom laid out on the ground through the Sahara and in northern Sudan for weaving tent cloth. In Nigeria and Cameroon, women used an upright version of it, manipulating both heddle and shed stick to weave cotton and other yarns. Except in the southern Igbo town of Akwete, however, it has recently largely given way to the double-heddle loom, yet to be described. In the Cross River region in southeast Nigeria, as throughout the central African forests, male weavers used a more-or-less upright single-heddle loom to weave raffia. In parts of northeast Nigeria, and seemingly across the savannas to east Africa and south to Zimbabwe, a horizontal version of this loom type, raised off the ground but with a fixed heddle, was used in weaving cotton textiles. Throughout West Africa, from Senegal to Chad and from the sahel to the coastal region, the more commonplace loom type has both sets of warps leashed, each to one or other of a pair of heddles linked by means of a pulley suspended above the loom and with pedals worked by the feet below. The advantage is, of course, that both hands and feet are employed, enabling cloth to be woven with greater speed and efficiency than is possible using single-heddle equipment. This loom type is also used in Ethiopia and by Arab weavers in North Africa. However, in West Africa the loom itself, with which this double-heddle system is used, has two features particular to the region: the first is the dragstone with which the warp elements are held taut. The second is the narrowness of the web; for it continues to be both normal and commonplace for cloth to be woven in a long, narrow strip often no more than about 4 inches (10 cms) wide, although in some traditions the web may be broader, perhaps up to about 12 to 14 inches (30-35 cms) and cloth as narrow as a .5 inches (1.5 cms) is known. Once the desired length is complete, it will be cut into pieces and sewn together edge-to-edge. It is only then that any visual effects intended by the weaver can be seen, manifesting a specific arithmetic in the precise counting of warps and wefts, as well as in the geometry in the layout of pattern that weavers must learn, and learn how to develop, if a given tradition is to flourish. The patterning obtained through the process of weaving in West Africa is most commonly of three or four kinds. The first is warp striping, achieved simply by laying the warps as close as possible in the preparation of the loom and using different colors. The same pattern of stripes can be repeated across the face of the cloth, or two or more sequences of stripes can be placed in sequence, and the visual effects can sometimes dazzle the eyes as if the colors were dancing. The second means of patterning depends upon spreading the warp elements apart as the loom is set up so that, in the woven cloth, the warps are hidden by the weft. For in allowing the weft to be seen, it becomes possible to create blocks of color that can be aligned across the cloth, or alternated to produce a chessboard-type effect, or so placed as to create a seemingly random scattering of color. A third type of woven pattern involves an additional or supplementary weft that floats across the warps. This is either floated across each face, or is woven in with the ground weft when not required for the design. In West Africa, particular ethnic and/or regional traditions are characterized by specific ways of using these techniques. Warp stripes are still the most commonplace throughout the region, sometimes with supplementary floating weft patterns. One of the best examples of this is the Yoruba cloth known as aso oke, literally "top-ofthe-hill cloth," the hill identified as the location of the tradition received from one's ancestors, and woven in the major weaving households of Nigerian cities such as Ilorin, Oyo Iseyin, and Ibadan. Yoruba weavers also weave openwork. Since the 1970s young women in Yoruba weaving households have taken up the double-heddle technology and have established themselves as independent weaving masters with great success in places where hitherto the upright loom was the sole apparatus, with the further result of inducing its obsolescence. Weftfaced patterns are especially located in Sierra Leone and in Mali, where it has sometimes been used as a picture-making process. In both countries warp-faced and weftfaced traditions flourish side by side. Only two traditions, Asante and Ewe, both in Ghana, bring all three weave structures together in one strip of fabric, thereby creating forms that are impossible to replicate exactly on a European broadloom. (It has been tried.) The narrower loom facilitates these design processes by allowing very different patterns to be placed beside each other in the one cloth. This may in the end be the justification for the continuing flourishing of these traditions. The use of supplementary warps is rare, but is beginning to be popular with some Ewe weavers. Asante and Ewe weaving is popularly known as kente, and while not a word with any obvious etymological significance, it may be derived from the Ewe verbs that refer to the processes of opening up the warp and beating in the weft. Most North African weaving, whichever type of loom is used, tends to be weft-faced, and one can see this in textiles for clothing and in carpets. Tent cloths, however, are mostly warp-striped. In Somalia, locally woven cloth is generally a balanced plain weave that encourages plaid-like patterning, with stripes in both warp and weft. Weft-float patterns are a feature of some Ethiopian weaving, together with tablet-woven patterns of extraordinary complexity. In the raffia traditions of central Africa, cut-pile is the best-known means of patterning a cloth, but this is not part of the weaving process. In the cottonweaving traditions of east and southern Africa, the few surviving examples suggest that patterning was no more than stripes making use of the naturally different colors of local cotton. Africa is a complex social and historical entity. There are many histories in which the traditions of a given locality have become engaged with forms and fabrics introduced from elsewhere in the formation of local modernities now taken for granted. This occurred in the Middle East, Europe, and Africa; there is more on this to follow. There are continuities of form, practice, and ideas from one place to another, especially seen in the delight in breaking up an otherwise plain surface. In principle, there is nothing specifically African about this, of course, but there are specifically African forms of its manifestation. It also happens that some of these specificities depend upon a particular inheritance of the technical means available locally for the manufacture of a piece of cloth. 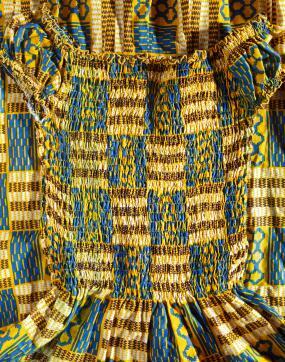 The delight in breaking up an otherwise plain surface manifested in hand-woven patterns, in a thousand different ways, especially in West Africa, is also seen in the techniques of resist-dyeing. In the western Yoruba city of Abeokuta founded in the 1830s, two forms of the indigo-dyed cloths known as adire developed with the advent of factory-woven cotton shirting. In one, raffia fiber was used to stitch or tie a pattern across the whole length and breadth of the cloth, while the other was made by pasting starch in a repeat pattern through cut-metal stencils. The raffia and the starch, each in its own way, would resist the dye to create the patterned surface. The manner in which the patterns developed was conditioned by the quality of the factory-woven fabric which was finer in texture than a textile locally woven of hand-spun cotton. Moreover, although indigo-dyed yarn was a commonplace element in weaving, locally woven cloths would normally only have been resist-dyed if they were old and worn and in need of toughening up for continued use. Then a few sticks or stones might have been stitched into the cloth, providing the original basis of the raffia-tied adire. The starch-pasted method almost certainly was adapted from European packaging; the zinc linings of colonial tea chests provided the original source of the metal for the stencils. In another Yoruba city, Ibadan, also founded in the 1830s, rather than use cut-metal stencils, comparable designs were painted freehand, again using the starch. There is also now some suggestion that while the imperative to pattern, and the raffia-resist method, has its origins in local sensibilities and practices, at least some aspects of these developments were influenced by ideas and/or practices brought to Nigeria by freed slaves repatriated from Sierra Leone. In any case, much of the early imagery of the starch-resist designs can be derived from topical events in colonial history. Long-running trade and family contacts between Lagos and Freetown may also have provided the route whereby a new set of resist-dyeing techniques arrived in Nigeria in the late 1960s. They quickly became known as kampala, so named after a well-reported peace conference in that Ugandan city. Kampala techniques include folding and tying, and stitching, the use of melted candle wax as a resist agent, and the use of factory-made dyes. These and other techniques are indeed found in Freetown, but also in Bamako in Mali, St. Louis in Senegal, and indeed all over West Africa. Meanwhile, the popularity of Kampala signaled the decline of adire in Nigeria. There has been a limited revival, mainly through the work of textiles artist Nike Olaniyi at her art center in Oshogbo; but otherwise the resist-dyed patterning using the technology identified in Nigeria as kampala flourishes throughout West Africa, even as Yoruba adire remains at best obsolescent. Mali is also the location of the Bamana technique known as bogolan. This is a method of dyeing the cloth yellow, painting designs in iron-rich earth to darken the dye, and bleaching out the yellow in the unpainted areas. Originally for the magical protection of young women as they are initiated into adult status, and of hunters, this technique has evolved in recent years to provide a modern fashion fabric in Mali and widely available and imitated in Europe and the United States, and also a means of current picture making. With so much variety in local traditions, we might ask why traders found a ready market for the cloths they brought with them; and yet we know that from the very first records of trans-Saharan trade, textiles were proceeding in both directions. The desirability of cloth, locally made and imported from elsewhere, was thus a well-established West African preference long before coastal trade with Europe, and the merchants must have known this from information available to them via North African sources. European traders from the outset of coastal trade had always included linen and woolen cloth amongst their goods. Some, in particular the Portuguese, traded local textiles from one part of the West African coast to another. They also captured slaves who were weavers and put them to work on the Cape Verde Islands making cloth with North Africa designs for the coastal trade. On the other hand, Danish merchants in the early eighteenth century were surprised to discover that Asante weavers unraveled the silk cloths they had obtained from them in order to reweave the yarn to local design specifications. Their shininess and well-saturated colors, though quite different to anything available locally, were perceived as effective within a local aesthetic. The local wild silk produced a less shiny grayish yarn, that was prestigious in some traditions but not in others. With local cotton and indigo together with other dyes, various shades of blue, yellow, green, brown, black, and a weak purplish pink were produced. A well-saturated red was not available, however; and yet red was almost everywhere a color of ritual value, though the precise content of that value was always locally specific. The color might have to do with transition from one condition of social existence to another, it could denote the volatile nature of a deity, or have wide-ranging connotations from success in childbirth to bloodshed in war. As soon as red woolen cloth and cotton yarn were available they were in demand. 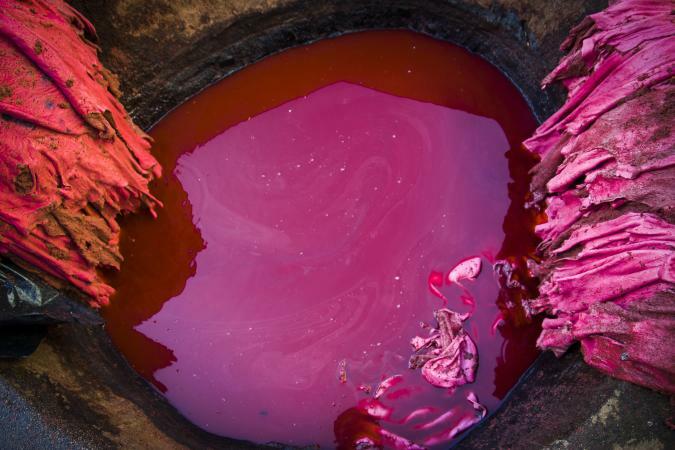 Similarly in the nineteenth century, the waste from Italian magenta-dyed silk weaving was traded across the Sahara to be respun for local weaving. In the late nineteenth century, silk was replaced by rayon and in due course by other artificial fibers, while ready-dyed cotton yarn assumed a substantial place in colonial trading accounts. The greater intensity and variety of color with modern dyes was one advantage, while the finer quality of machine-spun yarn was another. In a part of the world where conspicuous consumption was particularly manifested in the cloth you wore, in a context of increased demand given the democratization of systems of authority in colonial and post-colonial histories, the fact that machine-spun yarn could be woven faster than hand-spun cotton gave it an obvious advantage. The catalog of available textures was thus impressive: hand-spun cotton, machine-spun cotton, wild silk, imported silk (and its successors); and from the 1970s onward a laminated plastic fiber with a metallic core in all colors of the rainbow and more. We can see this same design aesthetic in the bright, almost blatant, African-print fabrics now so ubiquitous throughout Africa, Europe, and the Americas. Indeed, this is a proposition that is supported by what we know of their history. In the course of the nineteenth century, Dutch textile manufacturers wanted to find a way of replicating the Indonesian wax batik process, to produce the textiles at a cheaper price, thereby undercutting Indonesian production. In due course, they developed a duplex roller system that printed hot resin on both faces of the cloth in the manner of the wax used in Indonesia (hence the term "waxprint"). The resin resisted the indigo, and once cleaned off, allowed for the hand-blocking of additional colors. However, two unintended developments in this process rendered the designs unacceptable in Indonesia: an inability to clean all the resin off, leaving spots that continued to resist the additional colors, together with the way these additional colors were not an exact fit but overlapped with adjacent parts of the design. These essentially technical problems imparted to the cloths a variegated quality that Indonesians did not like; and yet, when, by chance, Dutch merchants, probably in Elmina (the precise details remain unknown), tried these fabrics on their customers they proved to be extremely popular. Once the sights of the designers in the Netherlands were trained upon this region of West Africa, they quickly learned that the visualization of local proverbs added to the local interest in these fabrics. The earliest dated example, is located in the archive of the ABC (Arnold Brunnschweiler and Co.) factory at Hyde, Cheshire, though it was produced by the Haarlem Cotton Company, is 1895. It shows the palm of the hand with the twelve pennies of the English shilling: "the palm of the hand is sweeter than the back of the hand," the point being that as the palm holds the money so we hope to receive good fortune. In the preindustrial technologies of Africa, printed textiles were unknown but for the two examples of adinkra and kanga. The former is an Asante cotton cloth produced at Ntonso, north of Kumasi, in which graphic signs are printed in black, using stamps made from carved calabash (gourd). Almost all of the individual patterns have an associated proverb, but this has not prevented the appearance of novel patterns based on the Mercedes-Benz logo, or making use of writing. These cloths do not convey precise messages, but evoke a tradition of knowledge about the social world. When the designs are printed on red, black, brown, or purple, adinkra is worn at funerals, whereas on white it has celebratory implications. 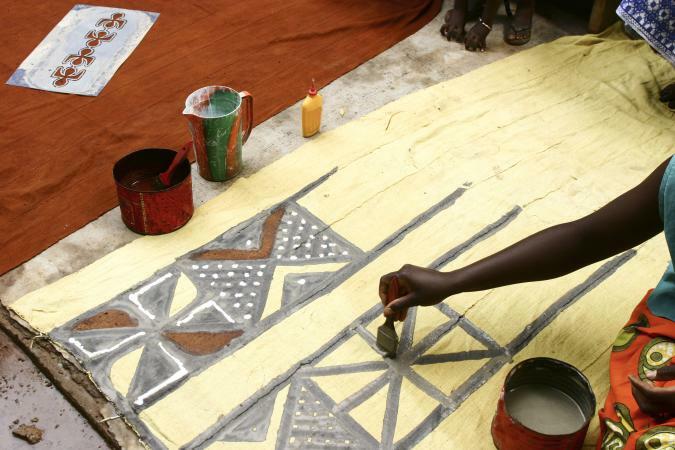 In Zanzibar and related centers of East African Swahili-speaking coastal visual practice the tradition of the kanga, developed from a hand-block-printing tradition brought from India. A length of cloth about one by two yards was printed in a variegated pattern with a differently patterned border that became identified by the Swahili word for guinea fowl due to its speckled plumage. Once these fabrics began to be factory-printed in India and East Africa, Swahili proverbs and political slogans found their way into these cloths with the development of designs that visualized the printed words. 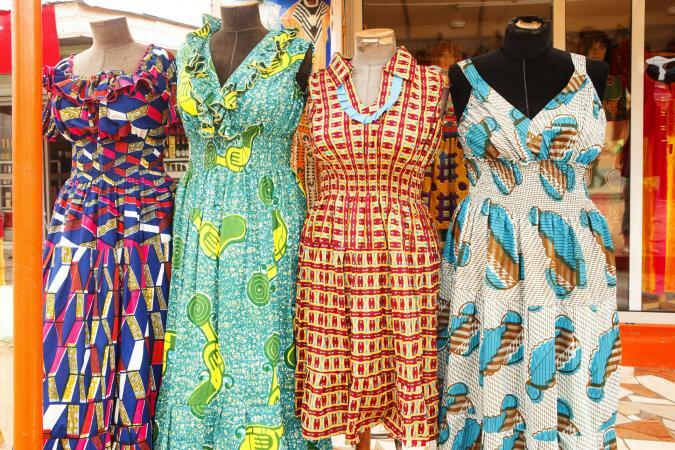 In both East and West Africa, variegated design and the visualization of proverbs seem to have been the keys to the success of cloths now designed and printed in substantial quantities in local factories. See also Adinkra; Adire; Bark Cloth; Bogolan; Indigo; Kanga; Kente; Loom. Barbican Art Gallery [John Picton et al]. The Art of African Textiles: Technology, Tradition and Lurex. London: Lund Humphries, 1995. Bolland, Rita. Tellem Textiles: Archaeological Finds from Burial Caves in Mali's Bandiagara Cliff. Leiden, Netherlands: Rijksmuseum voor Volkenkunde, 1991. Byfield, Judith. The Bluest Hands, A Social and Economic History of Women Dyers in Abeokuta. Oxford: James Currey, 2002. Clarke, Duncan. The Art of African Textiles. London: Grange Books, 1997. Gardi, Bernhard. Le Boubou-C'est Chic. Basel: Museum der Kulturen, 2000. Idiens Dale, and K. G. Ponting, eds. Textiles of Africa. Bath, U.K.: Pasold Institute, 1980. Kreamer, Christine Mullen, and Sarah Fee. Objects as Envoys: Cloth Imagery and Diplomacy in Madagascar. Seattle and London: National Museum of African Art, University of Washington Press, 2002. Lamb, Venice. West African Weaving. London: Duckworth, 1975. Lamb, Venice, and Judy Holmes. Nigerian Weaving. Hertingfordbury, U.K.: Roxford Books, 1980. Lamb, Venice, and Alastair Lamb. Au Cameroun: Weaving- Tissage. Hertingfordbury: Roxford Books, 1981. --. Sierra Leone Weaving. Hertingfordbury: Roxford Books, 1984. Menzel, Brigitte. Textilien aus Westafrika. 3 vols. Berlin: Museums fur Volkerkunde, 1972. Picton, John, and John Mack. African Textiles, 2nd ed. London: British Museum, 1989. Prince Claus Fund, 1998: The Art of African Fashion, Prince Claus Fund, The Hague, and Africa World Press, Asmara and Trenton, N.J. Note especially Hudita Nura Mustafa's "Sartorial ecumenes: African styles in a social and economic context," pp. 15-45. Renne, Elisha. Cloth that Does Not Die: The Meaning of Cloth in Bunu Social Life. Seattle and London: University of Washington Press, 1995. Ross, Doran. Wrapped in Pride. Los Angeles: University of California, 1998. Rovine, Victoria. Bogolan: Shaping Culture through Cloth in Contemporary Mali. Washington, D.C.: Smithsonian Institution Press, 2001. Sieber, Roy, John Picton, Rita Bolland, et al. History, Design, and Craft in West African Strip-Woven Cloth. Washington, D.C.: Smithsonian Institute, 1992. Spring, Christopher, and Julie Hudson. North African Textiles, British Museum, 1995. Tulloch, Carol, ed. Black Style. London: Victoria and Albert Museum, 2004. Note especially John Picton's "What to wear in West Africa," pp. 18-46.